This week’s South Western Star carries a report on the fortnightly meeting of the Battersea and Wandsworth Board of Guardians. Many of the issues the Board had to discuss arose out of the war – either directly or indirectly. A large number of staff had applied for increased pay as a result of the increased cost of living (a problem shared by the local councils as well), although as it was not all staff an amendment to grant the requests was not passed. Staff also caused concern when Mr Rees questioned the age of a man hired on a temporary basis – on hearing that he was 27 the response was to ask why he was not in the Army, and on discovering that he was from Alsace one member commented that he was from the Blue Alsatian Mountains (a song, the words can be found here) and Mr Rees commented that he ought to be “over the water”. Mr Rees was clearly a keen supporter of the war, as he also moved that 120 beds at the Swaffield Road institution should be offered to the War Office for wounded soldiers. The beds in question were currently allocated to the elderly and the proposal was to transfer them to the main building, as there were 300 spare beds there and it would then be possible to create a separate entrance for ambulances – there were already wounded soldiers at St James Hospital, who had been admitted in March. Both this and another motion by Mr Rees were passed, the second motion proposed creating a return which would show how many people of military age were currently employed by the Guardians. This motion proved slightly more controversial, as both Mr Winfield and Mr Archer thought it was akin to conscription and forcing men to go to the Front. Mr Winfield would prefer the Government to be responsible for conscription, whilst the Guardians could hold men’s jobs. The homeless West Norwood team may fulfil their remaining Metropolitan League fixtures, but as nobody, player or otherwise, takes any interest in the games, it does not matter… the group of clubs forming [the League] have no trophy, no medals, no subscriptions, indeed nothing but a private arrangement for matches among themselves. Perhaps the only positive in this report was for the Tooting club, who beat Croydon by 4 goals to 1, three of those goals being scored by Honor. 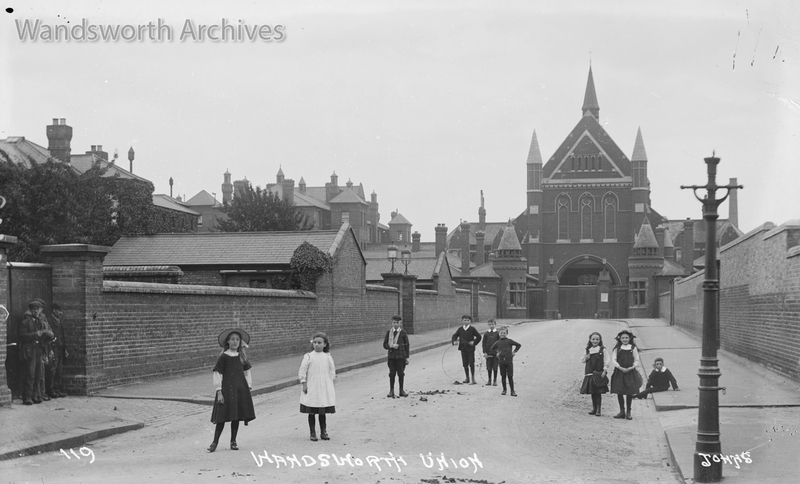 The Board of Guardians for the Poor were the management committee of the Wandsworth and Clapham union and its various institutions – also known as the workhouse. They were an elected body who met regularly to discuss management issues, including how their work was affected by the war and considering how to alleviate distress caused by the war. Their meeting of 20 August refers to the Local Committees being set up to deal with distress caused by the war. This meeting was the first ordinary meeting of the Board to take place since war had broken out. So immediate were some of the potential effects of the war that the Board had held two Extraordinary Meetings in the past two weeks. They had concerns over whether or not they ought to stockpile food on 6th August, while several of their suppliers asked to be released from their contracts owing to foreseen difficulties in fulfilling them (all but the fishmonger were refused and were to be reconsidered). The second Extraordinary Meeting, on 13th August, again decided not to release suppliers from contracts so long as goods were reasonably available, and put up notices to remind everyone in their institutions to practice economy. The meeting had a lot to consider – there was an argument over a mother’s complaint about the treatment of a child at St James’ Infirmary, which was extensively reported on by the Wandsworth Borough News. The News did not report any of the other discussions held by the Board, but their minutes had several updates following their Extraordinary Meetings. As with the Extraordinary Meeting, a big issue was how to deal with financial distress. Staff who dealt with Outdoor Relief (payments to those not in the workhouse, or Wandsworth Institution as it was then known) were recalled from holiday and they decided to co-ordinate with the local committees which councils were setting up to make sure that people were not receiving two sets of payments. The Board meeting took place the day after the Wandsworth Committee was formed to administer the Prince of Wales National Relief Fund. That meeting was so well attended that the list of those present covers two pages of the minutes. Letters from the Local Government Board encouraging the temporary filling of vacancies were circulated to help prevent local financial hardship. A 45 person strong Grand Committee was formed, with sub-committees for each ward. The Putney ward committee alone had 40 members appointed. Each committee agreed to find volunteers for administration, with one secretary appointed by the Council, and were to have their first meeting on 27 August. It’s hard to know if the incredibly high attendance at this meeting was concern for the cause, interest in a high profile fund or enthusiasm for doing their bit for the war. Certainly attendance at the next Executive Committee meeting in September was not quite so high!